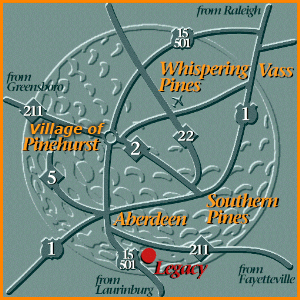 Legacy Golf Links is located on U.S. Highway 15-501, just south of Aberdeen. By car, you will most likely arrive via U.S. Highway 1. Legacy is about 3 miles south of Highway 1 on U.S. Highway 15-501. Travel by air presents several options. Delta is the carrier that currently comes to Moore County Airport. The airport is convenient to the three villages of Southern Pines, Village of Pinehurst, and Aberdeen, and has adequate facilities for those flying private aircraft. Major airports nearby include Raleigh-Durham, an American and Midway hub; Fayetteville, featuring Delta commuter service; and Greensboro, a Continental Airlines hub. AMTRAK provides daily rail service to Southern Pines. Click here to view mapquest.